I received a comment on the "Art of Customer Development Conversation" post regarding B2B Customer Development conversations and specifically, "how to navigate complicated customers where you’ll ultimately need approval from 3-5 parties while dealing with motivated saboteurs." The number one problem with Customer Development in B2B environments is that startups begin the Customer Development process too late. The revenue plan has been sold to the board, the product is done or near-done, and a marketing launch date has been chosen. Despite the increasing popularity of the LeanStartup "movement," this is, IMO, still standard operating procedure for most B2B startups. So having skipped Customer Discovery entirely, the company founders have neither validated their problem assumptions nor their proposed solution. The board eagerly awaits first revenue and to that end, will even help hire the first VP of Sales in order to accomplish this momentous milestone of best-laid plans. Welcome to the maze of complex B2B sales. Did you think B2B sales was going to be straightforward; based solely on rational, business-savvy calculations? Based on the bottom-line? Most everyone recognizes that the B2C sales process requires appealing to consumer's emotions. But believe it or not, business buyers, influencers and users are human, too, and thus are not-exempt from emotional decision making. Ego, hierarchy, competitiveness, fear, grandstanding, sycophantry join budget, market share, revenue, profits, risk, time, resources in the sale. The "Status Quo Coefficient" represents that which you must overcome above and beyond the pain your product solves, in order to make a sale. If you are practicing Customer Development prior to product launch, then Blank's The Four Steps to the Epiphany goes into great detail about how to discover and validate your understanding of the complex selling environment. In less detail, but perhaps with more specific tactics, Vlaskovits and my The Entrepreneur's Guide to Customer Development is a good resource for executing your Customer Discovery plan. During Customer Discovery, you are not selling, so you are in a better situation to have "learning conversations" with prospective customers. Your aim is to establish relationships inside businesses who are likely to be early adopters. This means you must find your champion. Your champion will help you understand who your saboteurs are and hopefully, how to navigate around them. As you build your product and validate your vision with the champion, you empower him or her to sell you inside the organization. These are tricky waters for the reasons described above. If you have a sales team in the field, let them go. If you have a VP of Sales unable to take a learning approach, let him or her go. If you are fortunate to have a board that has bought into learning before (large scale) selling, perhaps you are able to hire a VP of Customer Development or utilize outside resources. In 2005, Mark Leslie and Charles Holloway wrote a very #custdev-y paper, called the Enterprise Sales Learning Curve (.doc). Leslie and Hollow describe the same failures of scaling sales and marketing prior to knowing how market and sell that led Blank to establish the Customer Development methodology. I highly recommend this paper for B2B startup executives and investors. The “Renaissance” Sales Rep: During the initiation phase we would like to hire an individual who is able to facilitate broad based learning by the enterprise. This individual likely has a deep interest in the technology and in bringing together various customer departments with the appropriate representatives of the company. The individual is extremely resourceful, able to develop his / her own sales model and collateral materials as needed. Fundamentally, two approaches exist no matter who you bring on board: 1) go back to Discovery or 2) establish a painstaking process for winning your first five deals. For a peek out how this approach might be developed, I highly recommend you read this comprehensive interview with Sean Murphy. So what is it exactly, that you need to learn? 1) Validate Customer-Problem-Solution: No matter what stage your company is in, you need to validate that you have the right combination. 2) Do you have the "whole product?" Or do you need partners, systems integrators, etc. 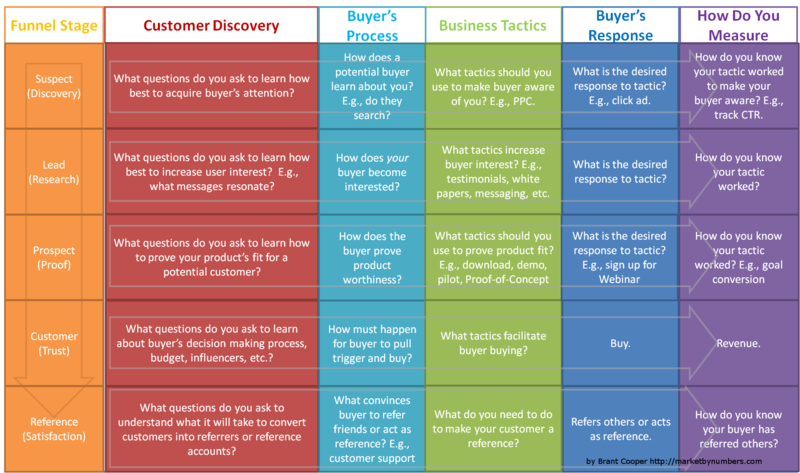 3) Identify the buyer's process and corresponding business tactics. 4) Identify all the player's in the process: user, influencers, economic buyers, decision makers. 5) What messaging and positioning messages resonate? 6) What does the corporate purchasing process look like? Who also is involved in decision making? Is this deal subject to other departments' approval processes? Are there compliance issues regarding this deal? Can legal or purchasing nix the deal? Do you keep a list of approved resellers/systems integrators? Are there departments who might disapprove of a deal (are you adversely affecting another department's budget)? All things considered, what is the "typical" length of the approval process? What other user groups/departments will benefit from a deal? Will a successful pilot assuage naysayers? Will you sign a contract whereby you purchase upon a successful pilot? The method for obtaining this information doesn't change significantly between pre- and post- product Customer Development: You must establish deep relationships. High-powered, "renaissance" sales people do this through "consultative" sales, whereby they learn what core problems the client needs solving and how they can work together to implement product that does the job. Either way, you must find an internal champion and developing this relationship is typically a painstaking process that takes months to evolve. The best way to find internal champions is through your network, no further than 1 link away (i.e., friends of friends). This means reaching out to the friends, family, and colleagues of you and your co-founders, employees, board members, mentor, advisers, etc., for introductions. As discussed in The Art of Customer Development Conversations, the answers you seek are not often the result of direct questions, but flow from conversations that grow deeper over time as the fit between problem and solution becomes tighter and trust among principals builds. Thank you for your post and links to very valuable resources. Your comments regarding reaching out through your network and nurturing conversations that deepen over time are very validating, as I find one of the hardest parts of B2B customer Development and Lean Startup Methodology is being patient enough to go through the process of reaching the right person, learning of their pain and validating our solution through developing a deeper cycle of ongoing conversations. Although I’ve read several warnings of hiring a “VP of Sales” while developing MVP’s, are you suggesting that bringing on a “Renaissance Sales” person with an established rolodex and existing relationships and trust with our target market could facilitate the conversation and assumption confirmation, shortening the the time for a B2B feedback loop? I think the chart at http://market-by-numbers.com/wp-content/uploads/2010/06/customer-development-funnel3.png represents a good start; I don’t have a better one. I am afraid as complex as it is that it’s really another 4-10X more complicated. I have been trying to integrate some of the models in “Why Killer Products Don’t Sell” by Ian Gotts & Dominic Roswell into our approach. I think they have a reasonable synthesis of “Four Steps to the Epiphany” and “Inside the Tornado” although some of their nomenclature is confusing to me (they define four selling style and then associate them with the suits from a deck of cards in a way that is not intuitive for me). But I think you are right to focus on the linkage/coordination between the selling process and buying process. The early stage buying process seems to me to be even less well understood than the early stage selling process by most first time founding teams. The problem of parachuting a large company VP of Sales into a startup is that the skill sets needed in each domain are almost disjoint. This is what Mark Leslie outlines some detail in the various incarnations of the “Sales Learning Curve.” He offers an analogy that I find apt between the prototyping process, comparing it to customer development, and volume production, which is what a successful large firm VP of Sales is very good at. A prototype line handles two to three orders more variation in specification and test, and three to five orders of magnitude less volume. I think there is a lot of tacit knowledge in the current practice of customer development that has not yet been well specified. The other thing I am continually surprised by is how much Peter Drucker understand and documented much of these challenges but used very different language than we do today. WOW! What a great post. This is very informative, I’ll definitely print off a copy and keep it handy. I am now implementing B2B marketing in my practices and I will be sure to take into account some of the advice you have offered. Really useful post on B2B Cust Dev. I added to Brant’s ideas in the book Lean B2B: Build Products Businesses Want (leanb2bbook.com) – a book to which Brant also contributed. Thanks.